The ideas and philosophies that make up Donjitsu Do were forged and proven effective many hundred years ago during dangerous times. There wasn't any type of attack that was out of the question. Therefore, Donjitsu Do is a system not bound by the rules and limitations of sports or recreational martial arts. Our goal is to be able to survive any kind of attack, mentally or physically. There are no rules in the street and there is no such thing as the ultimate martial art. The art you study should correspond with what it is you look to get out of it. For instance, a system like Donjitsu Do would be ineffective in a sporting arena as it was not designed for sport. Each style has its beauty, strengths and weaknesses however, one must know what they are looking for when choosing a system to study. All martial arts are not created equal. This system was created using a culmination of many different martial art styles that have been woven back together to create a complete system called Donjitsu Do. This system is designed for peace, self-preservation and enlightenment. If you are just looking to learn how to fight this is not the place. Donjitsu Do is a traditional martial art system designed for self-defense, combat and self realization. Similar to many martial art systems, the name of its founder is actually part of the system's name. This is also the case in Donjitsu Do. "Don" being the first name of the founder is at the beginning. Don also means fiery or fierce. "Jitsu" (or justsu), being the Japanese term for martial art, is frequently used as a suffix for many different open handed and weapon styles of combat and literally means "technique or art". The term "Do" literally means "the way" and is a way of life which is practical, not only for physical benefits but in order to achieve a spiritual or inner development. All of these terms represent a single principle, a way of using the human mind, body or anything around you as a weapon in armed or unarmed combat. 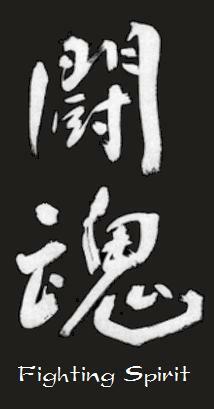 Donjitsu Do is the martial philosophies of one man; when literally translated it means “the art of fiery techniques". This signboard hangs above the kamiza in our dojo and reads “Ichigo Ichie” (One life one chance). This is very important for us all to understand that we only get the one life. How are we going to live it and how will we make the best of it. Will it be full or cut short? Very few times in life are we granted a “do over” in a survival situation. What will you do with that one moment, that one decision that may mean life or death; this is important to one who studies budo. 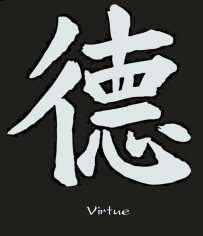 The martial artist, who is dedicated to a true martial art system, is a person with traditional values and morality. Preserving peace and harmony, and the ability to overcome ill intention are what the martial arts were designed for. Literally translated the term martial arts means, “the art of conflict prevention”. This basis will help you as martial artists, to develop a strong sense of passion for what you believe in. This is a very powerful motivation. In life you will be faced many times with moral decisions. A martial artist should only engage in combat for one reason only, to protect oneself, those who are unable to protect themselves or those for whom they are responsible. Violence should only be used when there are no other options. To better understand the purpose of Donjitsu Do training, we need only to understand one thing: survival! It couldn't be any simpler. Of course, at the same time it is much more complex than that. We already know that we train in the martial arts to prevail over an attack. It would be silly to think we have spent so many hours training just to be defeated. It is also much more than learning how to cause pain, or kill another. It serves a much higher purpose. Martial arts training is a way of developing the mind, body, and spirit, of a peaceful warrior who is one that only engages in combat for a good, and just reason. The attitude and strength of character will win the battle before it even begins. This is not a simple endeavor to achieve. It takes years or relentless training and searching inside ourselves to attain this goal. We must rid ourselves of anger, fear, jealousy, and hate. These are counter productive emotions that can cause us to become self-destructive. Shinryuken Masamitsu Toda, the 32nd Grandmaster of Togakure Ryu Ninja tradition wrote five admonitions for his students. 2. Choose the course of justice as a path for your life. 4. Sorrow, pain, and resentment are natural qualities to be found in life. Therefore, work to cultivate an indomitable spirit. 5. Hold in your heart the importance of family loyalty and pursue the literary and martial arts with balanced determination. This was written on new years Day in 1891 over a century ago. It was written by one of his descendants, even a full century later it still carried authority in their hearts. I believe that these words hold great power as tools for life. We may not be direct descendants to the Togakure Ryu Ninja, however we are part of the ancient warrior tradition. As you train in Donjitsu Do, or in any martial art system you will pass through many different stages of growth. The journey that you begin from the novice to mastering the art is a long, up-hill road with many turns, peaks and valleys. You will encounter many emotional and physical ups and downs at which your training may feel slow or even stop at times. You must understand that this too is very much part of the training, and it is normal to feel this way. Do not let these emotions discourage your training. The journey taken by the true martial artist is also a journey within ones-self. This at times can be disturbing. During this quest of truth you will learn much about yourself. We have all heard the phrases “patience is a virtue“, or “just be patient, your time will come“. Why is patience a virtue? When my time comes, what will I have to show for it? These are common questions asked by people who have no patience. For most, patience is not something that comes easily; it has to be learned and comes with age and wisdom. The dictionary lists the word patience as the ability to endure without complaint. One might ask what do I have to endure? One endures the trials and tribulations of the wait. Enduring the wait, and then realizing what you have accomplished because you were able to wait and work for it teaches us patience. During my youth I had no understanding of this concept, and had no patience, I wanted everything yesterday. When I wanted something I needed it right then and felt I could not wait any longer or it might not be there tomorrow. I had many reasons of why I couldn't wait, it was because of this or that, and it was because someone else didn't do their part, but it was never because I had no patience. I eventually found patience through the martial arts and today firmly believe that without my training in the martial ways, it may very well have eluded me. It taught me to relax and blend with my environment, as well as the understanding that everything worth having takes time and effort. The time it takes to master any endeavor worthwhile takes great patience, dedication, and perseverance. I tell my students often, “ If it were easy everyone would be doing it”. Most want a quick fix, short cut, or an easier way of doing things. In today’s world there are many ways to do something quicker with some new gadget, or program. This has made people soft and lazy. Understand, improvement is good but it can also become a crutch. Traditional martial arts are one of the few things left that teaches patience, and has no short cuts or quick fixes. I have actually had people come into my dojo for a free lesson and immediately afterwards ask if I knew of a school that was easier. This was a person who wanted something for nothing. Someone not willing to put in the time and effort it takes to become a martial artist. I would also venture to say this person had no real concept of what martial arts is truly about. Patience is a virtue, a virtue worth having, and what will you have to show for it? Inner peace, harmony, and the realization that you were able to walk a road few will tread, and succeed. In the midst of battle, mistakes meant certain death. Warriors of ancient Japan could not afford to make mistakes in combat. This theory has not changed and still applies today for modern warriors. On the other hand the only way to learn any martial art is by making mistakes. In the dojo these very same mistakes will show you where you are vulnerable. This allows you to pinpoint your weaknesses. You must always train with the intensity that would be found in actual mortal combat, knowing a simple mistake could be fatal. At the same time you must accept the fact that in training mistakes are normal and are a part of the learning process. Never dwell on your mistakes, however pay close attention to what caused the mistake. Fix it, so it won't hinder you in the future and move on. Each time you make a mistake and correct it, think of it as finding and patching holes in your defenses. In training, never settle; always strive to better your technique. Power involves far more than applying muscle to any technique or action. Actually, muscle or brute strength alone will thwart a student who is attempting to deliver a powerful blow. From a physical point of view, the subtleties of technique will provide far more destructive power than shear muscle strength. The driving force behind any truly powerful technique is going to be predominantly mental. It comes from a single-minded focus of intensity. This attitude comes from several mental factors; including self-confidence, determination, belief in the cause for which you are fighting and most importantly, all out commitment. It also stems from an unremitting resolve not to be defeated. One is more likely to achieve victory over an opponent if they are determined not to lose, rather than trying to win. If you are trying to win you are more likely to take chances and put your self at risk. A life or death confrontation can end in a blink of an eye, with one of the combatants left lying dead on the ground. Warriors such as the Samurai and the Ninja could not afford to make mistakes. Simply put, mistakes meant certain death. The primary goal of our warriors training is freeing the practitioner from confining effects of limitations, whether imposed by ones self or external. This is where traditional and tournament schools differ. Tournament training is very strict. If any rule is broken you are disqualified our lose points. The referee warns you if contact is too aggressive, or a cheep shot has been delivered. If you stick to the rules given to you and acquire enough points you are rewarded with money or a trophy. In the real world none of this exists. There are no rules, points, referees, trophies, and most of all, no honor. The only reward is walking away with your life. Your mind must be free and formal structure should be left in the dojo. Formalities are used as training tools in a classroom setting. Proper stances, weight distribution, and breathing exercises, are all used to build a base for learning technique. After a strong base has been constructed it is now time for you to tailor these techniques to your body, and how you can make them work for you. This is why we hear so many times that a martial artist was defeated by a street fighter. Too much structure was used in combat. You must be able to adapt and have a broad base of combat skills in order to survive your opponent’s attacks. You must remember he has no formal training, and his attacks will be wild and with no form, or reason, other than to hit you as hard has he can. Especially in the sport school, students train against someone who fights the same way as they do, and for this reason are able to read the other person. This would be no different than meeting someone from another school of thought, such as Kung Fu vs. Karate Do, or Tae Kwon Do vs. Ju-jitsu. For this very reason we should study how a street fighter moves, and attacks as well as studying other martial art systems to better prepare for any encounter. Practitioners, who are exclusive to a specialized or closed-minded system of fighting, will be in grave danger when they discover themselves in a situation for which their specialized system of fighting is useless, and ineffective. One must be able to adapt to any given situation. Spontaneity is something we all have. It’s not something we really have to work to achieve, however it is something that has to be rediscovered in ourselves after years of conditioning and fitting into the norm as we enter adulthood. As a child we could be and do anything, but as we get older we conform into what is accepted. In our Mon (family crest) the bonsai tree represents you as an individual. There are no two people or trees that are just alike. Even twins have very different personalities. Each of us is very different in many ways mentally and physically. We all have different beliefs, strengths, and weaknesses. We learn things at different speeds. Some are more athletic while others are what you would call more book smart. Many people are very philosophical and can think very deep thoughts, but have little common sense. We must take all of these factors into account. These factors determine how fast or slow you will learn new techniques, or philosophies. However, it does not determine whether we can or can’t learn. Just because it may take you longer doesn't mean you are not capable of learning. Remember your age, athletic ability, speed, maturity, and motivations are very different than any other person and so are your rates of progress. Knowing this you should never try to compare yourself, or your rate of progress to others. Even though we all have come together as a family to learn the martial ways, each person has his or her own reasons and motivations for training. Some enter the martial arts for physical fitness, some for sport or recreation and others for various personal reasons however, somehow regardless of the reason and the time it takes they all if dedicated will find the true reason for beginning their martial arts training. This is self-realization and along with the self defense; this is the martial way. This is a question that often presents itself when discussing the concept of engaging in combat. At first one would think this to be a simple straight forward question, with only one seemingly obvious moral answer – to only fight when one has to. No one should engage in needless violence. To only fight when one has to would be the correct answer, but I feel that it is important for one to look into the question and study it on many different levels. If the question was phrased as “When should we fight?” as opposed to “When do we fight?” does that change your interpretation of the question? Even though it can read to some as the same, this minor change in wording allows us to view it from a slightly different perspective. At first read one could assume that it would only apply to a physical attack. However, that is only one way to read or view this question and this is why I would use the word “should” instead of “do”. It is a judgment question that each of us regularly deal with in our everyday lives and relationships. It is an internal question that helps us to determine who or what we decide to stand up and defend. Regardless if it is an idea, belief, person, or group, at some point we have to make a decision as to where we stand on any given subject. This is where we take a stand or make compromises in our lives. At times, depending upon the subject matter, your decision could actually put you in physical danger and become much more serious which leads us to the most common interpretation of the question. For my students and anyone who truly studies budo, this question is deeper and should be explored and understood on many different levels. Noun: A violent dispute, confrontation or struggle. Verb: To take part in a violent struggle involving the exchange of physical blows or use of weapons to do harm. When we use the term “fight” most people associate it with a physical encounter which is understandable given its definition. However, if you break down the actual encounter and analyze it from its inception it often begins a lot like this: two or more individuals enter into a conversation which soon turns into a deep discussion and then at some point into a disagreement. Now, fueled by anything from strong personal beliefs, religion, politics, or alcohol, etc., this discussion has started to break down. At this point people begin to become defensive as they may suddenly feel as if they are under attack and the disagreement starts to heat up and begins to become volatile. Heated hurtful words and/or threats are now being exchanged. When engaging in this level of fighting one needs to slow down, gain control of their emotions, and decide whether what they are fighting about is actually worth pursuing. Verbal altercations are typically due to a breakdown in communication or as a result of misinformation. In most cases verbal altercations can be easily resolved. However, our history books are full of incidents that may have started in much the same way but were not easily resolved. Some questions you may ask yourself are: How strongly do I feel about my viewpoint? Does it really matter in the greater scheme of things? Will the outcome change my life or is it merely a strong difference of opinion that fighting over will never change? In answering these questions, one should then wisely choose his or her battles and maybe just agree to disagree. In order to fully understand the first question of “when do we fight”, we must also ask “why do we fight” Other than self-defense, there are many reasons people fight: to gain power political or otherwise; to show dominance over others; to obtain money, land, or other equitable items; conflict of religious views; or to just simply be heard or to prove a point. Regardless, the reason must be driven by good, a cause that would not just affect you but your family and/or community, and should never be driven by pride, greed or revenge. Your reason to stand your ground and defend yourself must be done with pure intentions. Now, it may sound like I’m talking about going off to war but when it comes down to it this is actually how wars start, with some sort of disagreement between people, communities, states, and countries. As a warrior one must be in control of their tongue and be able to see when things may be getting out of hand and find a way to defuse the situation before it has gone too far. True self-defense means dealing with a potential situation before it gets out of control. Some call this concept “verbal judo”. The late Bruce Lee called it “the art of fighting without fighting”. In Donjitsu Do we call it using the warrior’s eye. Regardless of what it is called, if one can see and defuse a potentially heated or dangerous situation before it gets out of hand he or she has begun to understand mental self-defense. As I have mentioned many times in my writings and teachings, there are two types of self-defense: mental and physical. Mental self-defense is the most important for a warrior to master. It is also the one utilized in the first part of our understanding of the question “when do we fight”. It is how we perceive and understand potential danger. This information allows us to properly conduct ourselves as well as dictate how we react in different situations and environments that we may find ourselves. Physical self-defense is the actual hand-to-hand combat that most people relate to when thinking of martial arts training. Physical self-defense leads us to an entirely different level of our question. So, now that we have an idea as to how fights start, what causes them, and what to look for, we now need to understand what encompasses a physical fight. We can apply our earlier definition of a fight and understand that it is about a person or persons wanting dominance over another through the use of a violent physical altercation. One studying boxing or martial arts would most likely say it is like sparring. Verb- Sparring: Make the motions of boxing without landing heavy blows, as a form of training. It is essentially “free-form” fighting, with enough rules, customs, or agreements to make injuries unlikely. To bandy words about in argument: dispute. The above definition of sparring gives us a pretty clear distinction between fighting and sparring. In the system of Donjitsu Do we do not spar. Students are taught that fighting is not a game and fighting should not be considered fun in anyway. The act of fighting should only be used as a form of self-defense. My students are taught that when confronted and physically attached, they are to do one of two things: escape or contain. To be able to escape, students are taught to do enough damage to their attacker to make him physically unable to continue his assault. It is not that their attacker does not want to continue their attack, but that they are physically unable to do so. To contain, students are taught to end the assault by containing their attacker. This is achieved by forcing their attacker to submit through the use of pain compliance. To contain their attacker students must be in complete control, rendering their attacker unable to continue the assault due to the fact that any resistance would cause intense pain or injury. In both of these scenarios the conflict has been halted by the student and the attack is over. Thus, there is no fight. When two or more people engage in physical combat the goal is to stop or gain control of their adversary. Fighting only happens when you are unable to so and both parties are struggling to stop or contain the other. Once one gains complete control there is no more fighting. In Donjitsu Do we believe that when you engage with another and the tactic, idea, and technique used are delivered correctly the threat will be extinguished and there will be no fighting as the conflict is over. So, from the perspective of Donjitsu Do the answer to the question of “when do we fight?” is simple: It is when we do not have complete control over the situation or an opponent. With this understanding, lots of hard work, blood, sweat, tears, and a deep understanding of budo, one will hopefully never have to fight. 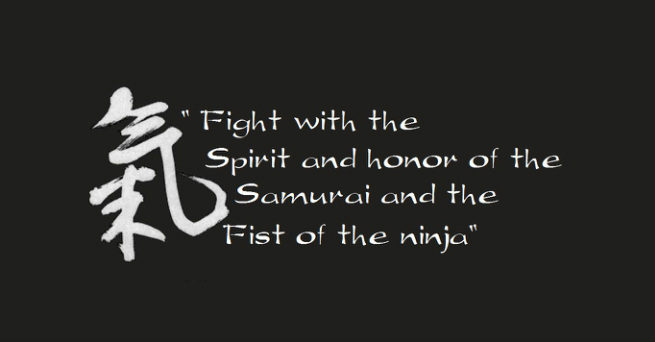 A saying often used in Donjitsu Do, is to “Fight with the sprit and the honor of the samurai, and the fist of the ninja“. To have a better understanding of this idea we will first look closer at the life of these two great warriors, the samurai and the ninja. One must first understand that the history of Japan is steeped in complexity and change from period to period as to be expected. The warrior class existed very early in Japanese history and has evolved into what we now know and admire as the samurai. We Samurai were considered military retainers who were at the service of the shogun and stationed in different provinces. Some were related to the ruling class others were enlisted men hired to serve under different daimyo forming immense armies. All belonging to the same class, from mere foot soldiers to high ranking mounted horse men, they were know as men of war (bushi), commonly called retainers or vassals of the empire. Once restricted to certain ranks, the term “samurai” was later extended to all warriors who were permitted to wear the long and short swords (daisho) under the service of their lord, which translated into “one who serves”. The samurai served his master unconditionally, giving his own life if necessary to protect his master. Often stories were told of retainers wearing their master’s armor while riding off knowing he would certainly be pursued and potentially killed if caught while allowing his master to escape. As a bushi, the retainer primarily had to be prepared to serve his master in the capacity of a warrior. He would discharge this obligation in an absolute manner, with no reservation about confronting danger. His entire philosophy revolved around a concept of complete disregard for his own safety and life, which he has by oath, placed at his master’s disposal. He lived by a code of ethic which he would allow him to never pause to ponder the nature, reason, or effect of a superior’s command for only a coward would question it. This code known by some as the code of death often portrayed the samurai as a figure caught in a web of a blind obedience. A Samurai was always prepared to meet a violent end. A man named Francesco Carletti in the 16th century wrote about the Japanese, “there is no nation in the world which fears death less”. This contempt for death that the Japanese had would become known the world over. People in the west perceive them as no more than mad men without any regard for life. A samurai began his training at an early age and was able to overcome man’s natural fear of death. He was also trained to think of his life as not his own. However, the samurai did not seek death but actually looked for a reason to live. This misunderstood code of death which was actually called the Bushido “way of the warrior” It taught the samurai that by facing and embracing death would help them to focus on the things that truly were important: strength of character, family, and building personal relationships. Living each day as if it were their last helped them to realize how important and fragile life really was and how quickly it can be taken away. A large amount of the samurai’s training was spent learning to die well. However, this did not have anything to do with the act of dying but how they lived their lives. Each day the honor of the samurai was at stake and to the samurai nothing took precedence over honor. This idea still holds true today for many people and not just those training in martial arts. A popular saying among warriors was “one’s life is limited, but his name and his honor, will last for generations to come“. The samurai knew that his death would eventually come, but his name and legacy would stand the test of time and affect those who bore the same name. His actions in life could ether bring his family great honor or shame. Throughout time we have always been able to associate a person’s name with a great deed, event, mistake, or evil. What comes to mind when you hear the names: Charles Manson, Adolph Hitler, Lee Harvey Oswald, O.J. Simpson or Bill Clinton? No matter what good deeds each of these men may, or may not have done, during their life we only want to remember one event or chain of events that took place during their lives. Regardless of the relation to these men, their sir name is now tarnished. If we look at a different set of names we get an entirely different feeling from them, such as: Bruce Lee, Martin Luther King, Neil Armstrong, or Abraham Lincoln. These people gave something back that still has meaning and has brought pride and honor to their name and families. Each of these subjects became highly complex and those of aristocratic status were expected to master each of them. Appearance being very important to the samurai, who visually represented prestige and power, became somewhat secondary to the intellect of the samurai. This had to be more specialized, since administrative duties also had to be performed by the samurai. The samurai had found power in knowledge and this, when sharpened, gave the samurai yet another edge in warfare. It was said that when themselves or another samurai could not do anything that would go against the Bushido, a samurai would hire a ninja to do his bidding. 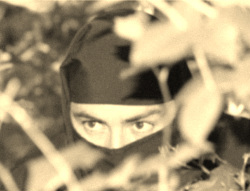 The ninja were legendary spies and commandos of feudal Japan who flourished during the 14th through the 17th century. Ninjutsu, the art of stealth and the way of invisibility, was the art used by the fabled black-garbed ghost. Often a handful of ninja could do the job of a hundred soldiers. Using subtle means that rarely disturbed the natural order of events, the ninja were able to work their will with very little action. Suggestion took the place of force, trickery and deception took the place of confrontation, while helping his foe unknowingly destroyed himself. The ninja while expending a minimal amount of energy, accomplished his goal achieving victory. Some historians have lead us to believe the ninja were considered commoners far below the status of the samurai however, in reality many ninja were actually Samurai and lived duel lives. The ninja had a comprehensive art for attaining their objective, which consisted of a graphic visualization of their goal, and an unswerving commitment of reaching that goal using the guidance of a perfect moral judgment. The ninja, unbound by the code of the samurai were able to concentrate totally on the goal at hand, whereas the samurai had to balance the commitment to his goal, and maintain his honor and name at the same time. The ninja, considered a nameless shadow, had no name and honor to protect because they were unknown and virtually didn’t exist. It was said that the stories and myths of the ninja gave them great power over the superstitious. Stories of long nosed demons that were said to be half man and half crow, could play with a man’s mind, and alter nature. Stories of ninja having the ability to pass through walls, turn into a puff of smoke, or become anyone they wanted, struck terror in some. The ninja who lived mainly in the mountain ranges of Iga and Koga, away from the limiting convention of the samurai, were taught practical applications of balance in the elements of diet, combat, thought, emotion, and the ability to utilize the forces and cycles of nature to their advantage. They also specialized in unorthodox methods of using standard weapons. To the ninja, anything could be used as a weapon or more commonly called by the ninja as tools. The primary tool of the ninja was his mind and adaptability however, through movies and myth, the straight bladed short sword (ninja-to) is the symbol of the ninja. Although it may have been shorter than ones carried by the samurai, it couldn’t look any different or he could have been easily spotted. It would have had many uses such as prying open a door, climbing, or digging a hole, and unlike the sword carried and cherished by the samurai it could be left behind if needed. Versatility, adaptability, special survival skills, and the sheer will to survive, set the idea of the ninja apart from the samurai. 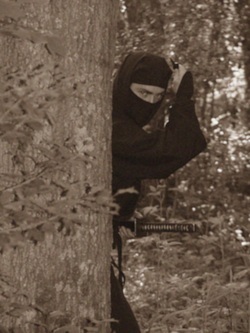 The ninja were able to easily adapt to any situation, environment, or form of combat making them dangerous adversaries. As a hypothetical comparative, let’s use the example of a person highly skilled in the arena of today’s tournament fighting. We will also assume this person has never been involved in an altercation outside of the ring, away from the referee and controlled sparring that he is typically used to. This would also be a person who enters the ring with another, understanding and agreeing to a prearranged set of rules and etiquette. If at any point during combat he strays or disregards any of the rules or takes a cheep shot the fight is stopped and the combatant is warned, or loses a point or points. This would mean dishonor to himself, his sensei, dojo, and to the other combatant. We will compare this with the similar stylized one- on-one combat of the samurai we commonly see depicted in a movie. Taken from the tournament ring and placed out of his element in a street survival situation, a tournament fighter is at a disadvantage. There are no rules, he may be potentially outnumbered, and he may or may not even know he is about to be attacked. He may quickly find himself overwhelmed as his opponent or opponents’ have no respect for him or nor have any rules of engagement. They will likely not fight fair and may even use a weapon. Now everything that he has been trained for does not apply to this situation. What he may think to be honorable in combat, his adversary would surely think less. There are many stories and youtube videos of untrained street fighters that have been able to defeat a trained competition fighter, because of the lack of adaptability. This is why it is important to understand that we must fight like we train and train like we fight. Every theory or techniques one studies must be checked in reality and be adaptable to every situation and environment. This cannot be understood unless you are able to explore situations outside of your normal training. Now if you take a person who studies street or combat self defense and place them in the same situation, thing may go very differently. He is still versed in all of the punching and kicking techniques that a tournament competitor might know but he is not bound by rules of etiquette. He is a survivalist who has trained for the worst case scenario and will use his environment and any mean necessary to survive. This person could be compared to the ninja bound by no rules. He would be versed in the same combat skills as the samurai and has prepared for the worst case scenario. As I have mentioned before, in many cases they were samurai who have were trained in special skills designed to deal with survival and adapt to unforeseen circumstances. We must live and carry ourselves humbly with honor and dignity, have respect for ourselves and others, be educated, be an intellectual versed in the arts while setting an example to avoid conflict as a true samurai should. Each day striving to live by the idea set by the Bushido code. However when forced to fight we become predictably unpredictable; have the cunning, speed, and moral judgment to know when to fight, and most of all, have the adaptability of the ninja to improvise and do whatever it takes to achieve victory for the greater good, our survival, and the survival of our family and name. Keep in mind that this saying and philosophy are an attempt to create a visual representation of how the ideas and concepts of Donjitsu Do apply to life and combat. While being quite the conundrum, a true warrior moves quietly through life passing through the shadows like the ninja while at the same time setting an honorable example to others as a true samurai should. Let this idea be a guide to help you understand that one must be a well rounded warrior, versed in all aspects of budo, and never labeled a specialist in any one way of combat. When people have visited my dojo they notice the artwork and many masks on the walls. One in particular usually gets the most attention. On several occasions I have been asked “What is the significance of the demon mask and why is it hanging in your dojo?” Some have actually been quite bothered by it and want to know if it has anything to do with what I teach. So I thought I would go ahead and answer that question for you now. Yes it does. I will begin with its origin, some of its history and then explain its importance in Donjitsu Do. Keep in mind that there are many different versions as well as interpretations of this mask its origin and what it represents. This also holds true in its significance to Donjitsu Do as it has a particular meaning to us as well. Regardless of the version used it has always been a way of expressing and stirring emotion. The various skin light and dark tones: white, red, blue, or natural, represented things such as class and depth of pain or darkness one would feel. It is probably the most popular and well known of all Japanese masks. Hand carved from wood, the oldest Hannya mask is said to be dated 1558. This mask is used in Shinto ritual dances and arguable the most recognizable and famous mask of the Noh Theater. 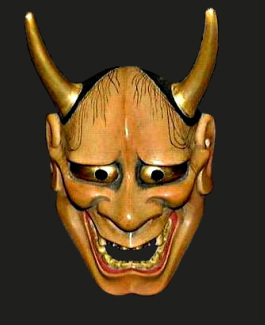 In a play this mask portrays the lost souls of women turned demon due to obsession and or jealousy. With its distinctive frightening pointed horns, bulging eyes, and sharp fangs, it expresses the full complexity of human emotion. These emotions include torment, pain, rage, jealousy, and loss of self. It symbolizes all that is dark within us, all that we fear. In the Japanese Noh Theater the plays typically tell a story of unrequited love. One in particular is that between a beautiful woman and a priest. Once scorned the women is overwhelmed with jealously and anger. Out of control she turns into a demon serpent, wraps her body around the temple bell, consuming it and the priest in the process of losing everything she loves and believes in. To this day in Japan a hand gesture of two index fingers sticking up from a man's forehead is a sign that the man's wife is mad at him or has become jealous. Although a bit cloudy, its origins may have come from early painted scrolls and legends from the Muromachi period. However, the origin of its name is said to be a Sino-Japanese word. Buddhist saw it as prajna or wisdom. One tradition claims it was the name of a monk named “Hannya-bo” who was said to have created the mask’s design. Another explanation was that it was the name sutras used for the perfection of wisdom. Variations of these sutras were considered to be very effective in dispatching female demons. Yet another says that it would have taken great wisdom to create the mask itself hence the name. Another historical use of the mask was to play on one’s fear of demons. 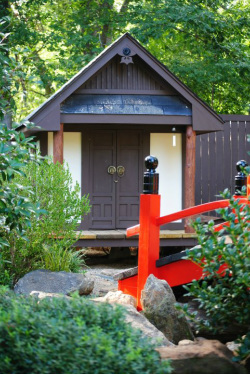 The ninja of Japan would use this to their advantage striking fear in their adversary through superstition. This is much like those who are frightened by it when they see it in the dojo. Imagine to some, maybe even you, what just a glimpse of this mask moving through the shadows may cause one to think. It may have been all it would have taken to get into the mind of an adversary putting them on edge. Night after night just a glimpse causes them to become uneasy and surely want to be anywhere other than there. Fatigue now starts to set in due to loss of sleep. “Something is out there!” or “Am I losing my mind?” Taking it one step further the ninja would use what was called “onibi” no “jutsu”, the art of demon fire. Wearing these wooden demon masks and utilizing fireworks, the ninja would further frighten their superstitious advisories making them seem all the more powerful and confirming their fears. There was something out there and now unknowingly terrified and blinded by their own beliefs used against them, they are no match for the ninja and may be easily overcome. This could have easily been a small group of ninja including the one on the inside gathering the information against a substantial adversary that could not be faced head-on. The ninja often times used the power of stealth, science, fear, and confusion, instead of force, to obtain victory. This is one of the reasons the ninja are often considered the "boogiemen" of Japan. However, today, seen a bit differently these masks are very common in Japan and people now believe the image of the demon placed in their home will actually drive evil spirits away and keep negative energy out of their home. One like the antique one pictured above and can be seen above our dojo entrance gate as well as in the dojo training hall. I also have a very beautiful antique one, given to me by my students, which hangs in my home to keep watch over my front door. So, in this regard, it can be seen as a good luck piece as it repels negative energy. 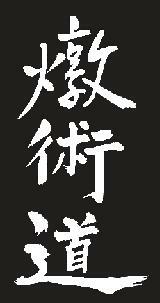 In Donjitsu Do it represents yet another important philosophy of Budo. It is an acknowledgment of the darkness or demons that we all have deep within each of us that we must control to maintain balance within ourselves. We are all capable of just as much love and good as we are destruction and evil. Anyone who doesn’t see that is hiding from the truth. In Donjitsu Do we learn to face our fears, understand what causes them, and all the while learning to control them. This concept is discussed further below entitled "Our Two Sides". Each of us has two sides. Our light side, which contains all that, is good, and our dark side, which contains our inner demon. Our demons contain all that is potentially evil in all of us. The strength of either of these two sides plays a large role in determining who we become. It is important to be thorough in your investigation of your beliefs, concerning how the human spirit operates in this world we all share. Seek out whatever it is that brings you closer to your own understanding of how life, the mind, and our own personal interactions with others help to create who we are. The strength of either of these two sides can determine either our attitude or mood on any given day. Take for instance; one day you are on top of the world and things couldn't seem better. On this day you are more likely to go out of your way to do something good or generous for a stranger. People around you pick up on this. A stranger may base his own idea of who you are or what kind of person you are on their first impression of you. They may think, "What a great person he or she must be". You get up the very next day and you have slept wrong during the night, or have symptoms of coming down with a cold. You don't really feel so good and now things don't seem to be going your way. The darker side of you, or your "demon", becomes more prevalent in your personality or attitude. You become shorter with others, things that just yesterday wouldn't have bothered you at all, today totally infuriate you. After this first encounter with you a person may get an entirely different impression of who you are. From its earliest times the term "martial art" has meant the art of conflict prevention. This also applies to inner conflicts. The goal of the martial artist is to find balance between our two sides. One must understand that we must have both of these sides. They are like yin and yang. We cannot have one without the other. What you have to do is to be able to take control of these emotions. Setting your mind on what you want it to see does this. This is the concept of "proper thought". Stimulus that our mind picks up from our environment, that is repeated input, programs our minds. The subconscious mind builds itself around what it is most often exposed. Positive input or conditioning leads to a healthy outlook on life. Negative conditioning such as fear, worries, or hate can only lead to personal limitations and eventual self-destruction. One cannot grow with dark thoughts in their heart. Therefore, we can control this by proper thought and becoming at peace with ourselves while finding balance between the two sides. There are many life forces all around us that exist and are in balance with each other. Causing harm to people, animals, plants, and growth causes you to become filled with delusions that you are a separate part of the world around you. Moving through the world with as harmless a manor as possible helps you to become closer and more of a part of the scheme of things. Promote life instead of destroying it. We must vow to ourselves to encourage the value of life to others. Know that life is precious and the taking of a life is only done when, and only when, there is no other option. The dark side of our psyche has a very important role in our lives. We must first look again at the differences in our two sides. Like the yin and yang we cannot have one without the other. There would be no good if there were no bad, no up if there were no down, and so on. Our good side is made up of all that is passive, good, and pure, while our dark side is made up of all that is aggressive, tainted, and potentially evil. The key is being able to control our darker side, or demons. If you were able to separate these two sides you would not be able to survive. Alone, the good or passive side of you would not even be able to protect you in most day-to-day confrontations. You would not be able to stand up for yourself. The good or pure side doesn't contain the aggressive traits that you would need. Your dark side contains these qualities. In this part of you lies the aggressiveness we need to stand up for what we believe. With both sides in balance, we are able to control them as easy as turning a light switch on or off. When confronted with danger we release our demon to protect us and then is immediately taken back under control when the threat of danger has subsided. Our fear of demons is timeless, but once we begin to understand that or inner demon is a vital part of our makeup, and that while under control, will give us great power in times of need while also giving us balance within. However, it is not something that is learned, but something that with time and a better understanding of one's self will begin to emerge within a true warrior. Most people are predominately good, and their demons are locked deep within, so they must begin to carefully remove these locks. Once the locks are removed, he will begin to surface however not all at once. Because this is aggressive behavior, students usually begin to feel their demon surface when free fighting. Because one's life is not actually at stake in the dojo one has to look through their mind's eye and place one's self in a life or death situation to lure their demon out. Once, a student came to me and said the first time they really felt it it actually scared them and they had never felt like that before. In the beginning, a student will only have brief moments where it flickers within them. Often times it only lasts for a second or two. Once it occurs, you will feel it. It is an unmistakable feeling much like a controlled rage. Athletes have a form of this, which they call, "the zone". This is usually when they have had a great game where they felt a rush of power where no one would be able to score, get past, or move them. They were in control of the field. However similar, this is not the same for a warrior. Much more is at stake than winning a game. His life, as well as the lives of others, is at stake. A warrior cannot afford to make a mistake. Unlike the athletes who will get another chance to play another day, a warrior understands there are no second chances and a simple mistake can mean certain death. I read a story once of how a challenge was issued to the master of a ninja ryu by another school. As by tradition, the highest-ranking student stood to accept the challenge for his master. Before the match had even been acknowledged a junior student jumped to his feet demanding he accept the challenge. Even though not the norm for handling such a situation, his sheer determination and enthusiasm won him this honor. The student, older than his sensei and not as highly ranked, would now face the man challenging the skill of his sensei. Without hesitation the student thundered to the fighting area awaiting his foe. Even though the student was not a good fighter, his wide shoulders, scared face and the look of determination on his face, made him look like a vicious adversary. Without knowing, his adversary stepped back as the student came toward him with no warning or formalities. Realizing what he had done, he threw up his hands and bowed in defeat before combat had even begun. When asked by the sensei why he had surrendered the challenger explained he was completely taken by the screams of intent and the demonic look upon the face of the sensei's student. Though probably a better fighter, he had been defeated by pure intention alone. Even in this story the challenger said the student had a demonic look upon his face. The student was able to release his demon on demand to the point that his adversary could not only feel him, but could almost see his demon. In this case, the demon did nothing but show his face to end the conflict. It is important that during combat one's opponent must actually feel their intent even if no action follows. This is known by the ninja as "the force of the killer". It is the feeling that your intentions project when you are determined to destroy another. In humans as well as animals, this predatory instinct is projected when one is determined to overtake an adversary. When animals are determining the pecking order of the pack this principle can be seen in its rawest form. Once one has staked its claim for leadership, it will eventually be challenged and there will be a fight to determine which one will lead. This engagement will go on until one has been defeated, and usually pinned to the ground. Both will freeze until the weaker has submitted to defeat while the dominant is still ready for any movement, or reason to continue his attack. Instead of killing the weaker it will back off so that the looser may take his position as an underling with both knowing who is in complete control. Having the ability to project as well as understand this frame of mind can be used defensively as well. This same projection of intent can also be used to feel when another intends to do you harm. To a warrior this is called "Zanshin", meaning "so alert you dominate". You actually feel another's intent to do you harm. You become so alert that any movement toward you is instantly perceived and crushed. As your martial skills develop and you begin to find peace within, you will be able to summon the demon that lies within you at will any time you sense a threat. Whether walking down the street or in a crowed mall, he now lies in the shadows of your mind waiting and watching. Regardless if he is allowed to strike or not, his presence will be known, and you now have balance between your two sides…understand?